The Panasonic 8064 is a set of four long-range cordless DECT phones providing a rich set of features at an affordable price tag. 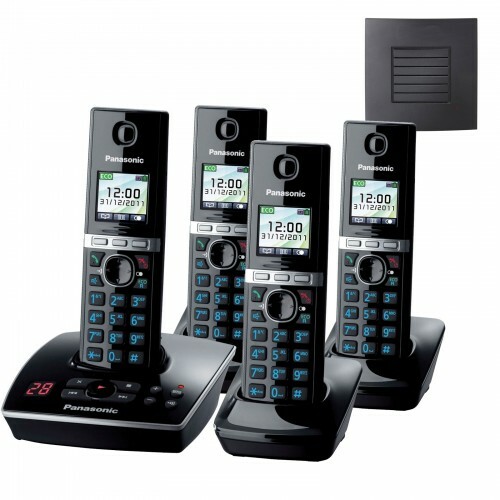 For your comfort, whether in the home or the workplace, the Panasonic 8064 offers excellent hands-free operation thanks to a high-quality speakerphone and a headset port for connecting any standard 2.5mm headset. An answering machine records up to 20 minutes of voice messages, and you can scroll through a list of them using the 1.4" colour LCD display. Ideal for either home or business use, the Panasonic 8064 set is ideal in situations where signal range is an issue. I\'ve been buying Panasonic products for years, and have always relied on them for good quality at a reasonable price and I have not been disappointed with the 8061. I had a look at some of the other phones, and they were either too expensive (who needs a landline phone for £100?) or cheap. When I found this - it seemed like the perfect choice, and now it\'s arrived I can say it is. The sound is good, the distance I can get from the base is incredible, its easy to use and the battery seems to last forever!. Well worth it! Good value for money. The base is a lot louder than our previous Panasonic, which is great. Very happy.